As some of you might already be aware each year I do my best to spend at least one week at Estancia Laguna Verde chasing the monster rainbows of Lago Strobel. Better known in some circles as Jurassic Lake. A place where trout average 15lbs. In addition to Lago Strobel, we also have access to smaller more intimate Laguna's or small lakes. Depending on the specific Laguna you have the opportunity to catch trophy rainbow, brown and brook trout up to 10lbs. If you enjoy stillwater fly fishing then Lago Strobel and Estancia Laguna Verde should be on your bucket list. Lago Strobel rainbows average 10-12 lbs, fish 13-20 lbs are common, almost every week of the season fish over 20 lbs are caught and, fish over 25 lbs are caught each year. I have witnessed friends of mine catch and release caught and released numerous fish including three fish that weighed 18, 20 and 22 pounds! This is primarily a walk and wade destination. The guides drive you to various spots along the 14 plus miles of shoreline the lodge currently has access to. We also have access to small Lagunas on the property containing rainbows, browns and brook trout. Some of these Lagunas produce trout in excess of 10lbs. We recommend a 7 or 8 wt rod coupled with a quality reel with a smooth drag and plenty of backing, at least 150 yds. As with any travel trip bringing an extra rod and reel is a good idea in the event of an accident. There is equipment available at the lodge at no charge should you break a rod or reel. A floating line is all that is required but you might consider having some sinking leaders (such as the RIO Versileaders ). Long casts are often not required but in general the longer the better. Lines such as RIO's InTouchOutbound Short perform well, especially in the wind. There is limited opportunity to fish Booby or FAB's on a full sink due to the rocky nature of Lago Stroble. However, quality fish have been caught on these so you might want to bring a full-sink, In Touch type VI or VII line if you would like to try these flies. You should have a half dozen or so leaders between 9-15 ft. Leaders designed for salmon and steelhead are the best bet. RIO Bonefish or PowerFlex Plus leaders are excellent choices as they turn over well when the wind is up. Make sure you have a good supply of quality tippet. RIO's Fluroflex Plus works best for subsurface presentations use Powerflex Plus for dry flies. The minimum breaking strength is 12 pound, 15 or 18 pound is better. RIO Versileaders are also a worthwhile, easy to pack, addition to your kit bag. Your standard stillwater flies including leeches, Wooly Buggers, Pheasant Tail Nymphs, and Prince Nymphs. Dry flies such as the Morrish Mouse and Chubby Chernobyl's are also recommended. Stout hooks are required, Lago Strobel is not a place for light wire dry fly hooks. Please visit my Blog to get a measure of the experience including what to expect, how to get there and what to bring. Please contact me via email to book your spot and for additional trip information including gear and flies. 2019 Dates: December 7-14, 2019 Book Quickly, Only 3 Spots Remain! I was initially introduced to the stillwater trout fishing available in the Parklands region of SW Manitoba over 10 years ago. Nestled in a region many don’t associate with stillwater trout fishing are some of the best public stillwater trout fisheries in North America. Lakes specifically selected and groomed for their ability to produce trophy-sized rainbows, browns and tiger trout. For the past six-plus years, I have been introducing fly fishers to this region through my hosted seminar trips. These all-inclusive trips provide a great opportunity not only to explore the productive lakes in the Parklands region but also to learn tricks and techniques that will improve your stillwater fly fishing anywhere in North America. Based out of the Russell Inn, my trips take place at two times each year, the first two weeks of June to coincide with the outstanding chironomid hatches and again in the fall when trout prowl the shallows building their fat reserves so they can survive the tough prairie winter ahead. The June trips provide the perfect outdoor classroom to perfect a variety of chironomid skills including indicator tactics, floating line long leader tactics and sinking line tactics using 5 through 7 weight systems. Fall trips focus on shallow water tactics using leech, minnow and scud patterns as well as the opportunity to experience the chaos of water boatman or backswimmer falls. Upon confirmation of your booking, you will be provided with equipment recommendations and a complete pattern recipes booklet containing a comprehensive list of proven patterns for the area. Seasonal guidance on which pattern styles to focus on will also be provided to ensure you have the right pattern selection on hand. Trip pricing includes six full days on the water, seven nights accommodation, food (breakfast, lunch, and dinner), seminars and demonstrations, access to a properly outfitted boat if needed along with scheduled time on the water with me. These trips are limited to a maximum of 12 anglers per week. Pricing is based on double occupancy, two students per room. For 2019 a single person per room rate of $2340 CDN is also available. Space is limited to 12 fly fishers per trip to provide the maximum quality experience. A 50% deposit confirms your spot. Join me at Corbett Lake Lodge. Located in beautiful British Columbia, Corbett Lake Lodge is a short 12 miles (20 km) drive south east of the town of Merritt. Corbett is a private access lake complete with a unique lodge experience making it a perfect destination for my on the water fly fishing schools. Corbett Lake Lodge offers comfortable cedar cabins with full kitchens, bathrooms with shower, and fireplaces. Most cabins have a view of the lake. The lodge also features three attractive Lodge rooms with a mini fridge and microwave provided. All accommodations are within easy walking distance of the dock. All meals and seminar instruction takes place in the lodge’s spacious dining room overlooking the lake and a beautiful wooded area. 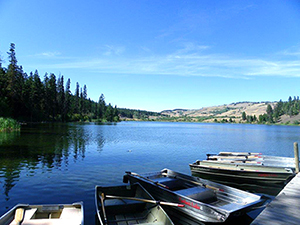 Corbett Lake is an intimate scenic lake featuring crystal clear water and lots of cooperative rainbows. It is the perfect backdrop to hone your stillwater fly-fishing skills. During the month of May, you will be able to perfect a variety of chironomid skills including indicator tactics, floating line long leader tactics and sinking line tactics using 5 and 6 weight systems. Corbett Lake also boasts a healthy Callibaetis mayfly population and casting dry and emerger patterns is a distinct possibility. Scuds, leeches, damsel, and dragonflies are also plentiful. Attractor patterns such as Booby’s and FAB’s also work well, especially when targeting sighted fish. Trip pricing includes three full days on the water, four nights accommodation, food (breakfast, lunch, and dinner), seminars and demonstrations, access to one of the lodges properly outfitted boats when you aren’t on the water with me. Space is limited to 12 fly fishers to provide the maximum quality experience. A 50% deposit confirms your spot. Upon confirmation of your booking, you will be provided with equipment and fly pattern recommendations. Join me at Stoney Lake Lodge for my Advanced Stillwater Tactics Schools. 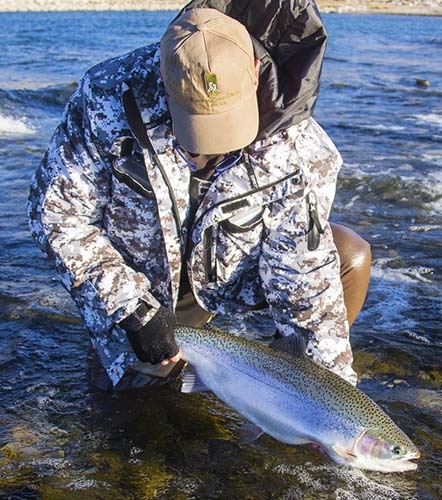 Stoney Lake Lodge is situated in the world famous Kamloops Rainbow Trout Region. 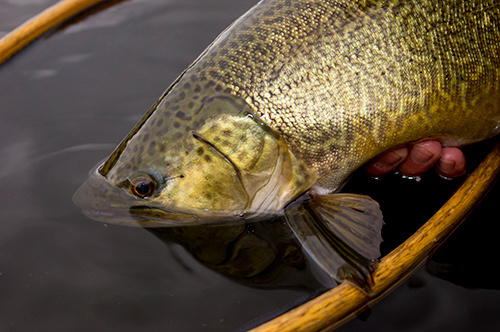 Trout in these waters are notorious for their average size and incredible fighting abilities. 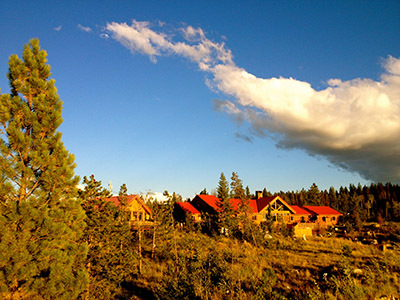 The lodge offers top class amenities and gourmet meals. Guests have unlimited access to Stoney Lake. Stoney Lake provides you with the opportunity to catch and release trout in excess of five pounds along with an impressive overall average trout size. These lakes only contain hard fighting, aerobatic diploid and triploid rainbow trout. Stoney Lake is nutrient-rich, teeming with aquatic invertebrates. Students can expect strong insect activity including chironomids, damselflies and possibly Callibaetis mayflies. Leeches, dragonfly nymphs and scuds are also always a good bet. Space is limited to 12 students. To register please email. This seminar books fast so don’t delay.